When cleaning your stamps, you have many options. You can use soap and water, a baby/face wipe or a specialist cleanser preferably with conditioner in it so it will keep your stamps fresh and new for a long time to come. I prefer a solvent type cleaner that removes any ink or paint I might be using. Try Papermania, Clear Stamp Cleaner. As matter of personal choice though, I do not over clean my stamps as it can damage the cushion under the stamp and loosen the adhesive in wooden stamps and may damage the longevity of acrylic stamps. 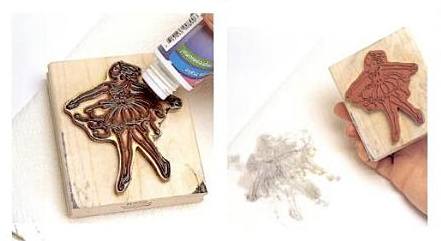 Blot the stamp on a clea,dry paper towel and reuse as neccessary or store.